Heat oven to 375°F. Line cookie sheet with cooking parchment paper. In large bowl, beat softened butter, sugar and egg using electric mixer on low speed until blended; beat in vanilla. Add flour, baking powder and salt; continue beating until well blended. Stir in 1/2 cup toffee bits. Refrigerate dough 30 minutes. Shape dough into 1 1/4-inch balls. Place 2 inches apart on cookie sheet. Flatten with bottom of glass dipped in sugar. Bake 10 to 12 minutes or until edges are light golden brown. Remove to cooling rack. In small deep microwavable bowl, microwave chocolate chips and shortening uncovered on High 1 to 2 minutes, stirring every 30 seconds, until mixture can be stirred smooth. 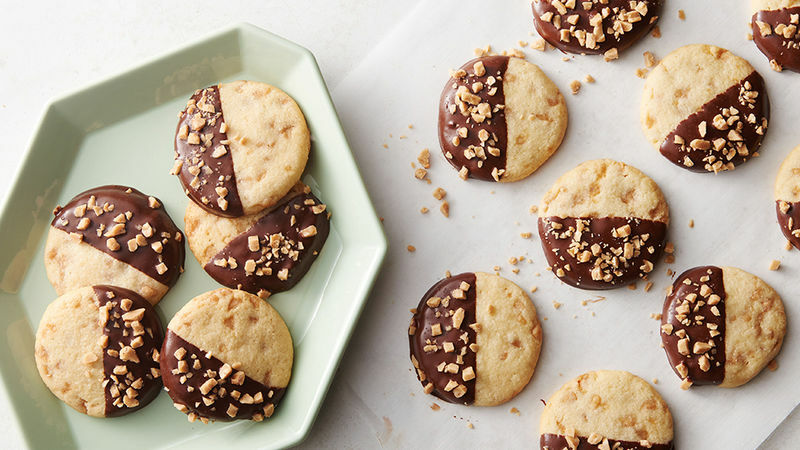 Dip each cookie halfway into melted chocolate, letting excess drip off. Place on parchment or waxed paper; sprinkle with remaining toffee bits. Let stand about 1 hour or until chocolate is set. To quickly set chocolate, refrigerate cookies 15 minutes. Store between sheets of parchment paper in tightly covered container at room temperature. You can use semisweet or milk chocolate chips instead of the dark chocolate chips. Toffee bits are sold in the baking aisle near the chocolate chips.